For seniors, parks and outdoor recreation spaces provide crucial benefits. These spaces can encourage elderly community members to head outside the home, exercise and socialize. Green spaces can be stimulating for seniors and can help them stay physically and cognitively fit longer. Fresh air, sunshine and physical activity can pay off for those enjoying their golden years, and designing a senior park can help you serve this important group in your community. 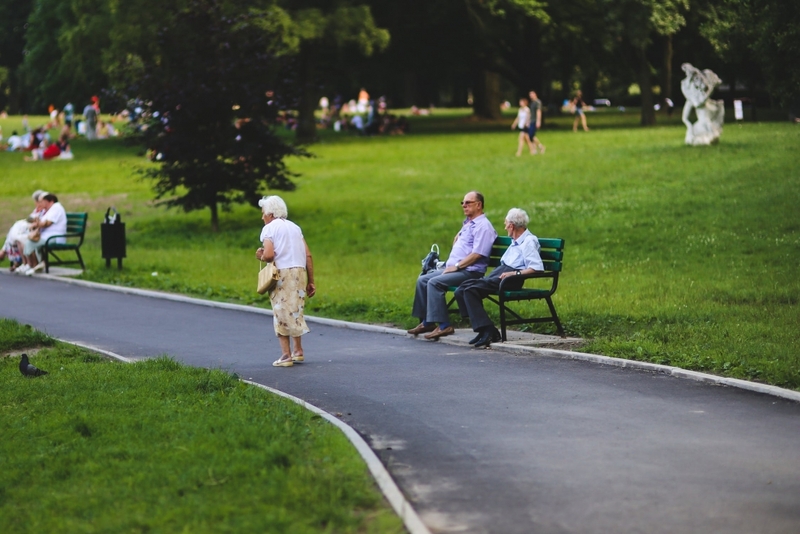 What Do Seniors Need in Parks? ■ Accessible, even ground surfaces that can accommodate walkers, wheelchairs and people who are fully agile. ■ Clean spaces with plenty of visibility and good lighting. Debris can be a trip and fall hazard, and good lighting is important for those who have age-related macular degeneration or other conditions that affect eyesight. ■ Shade. Seniors walking in the summer need to stay cool and will appreciate shaded areas as well as seating areas for relaxation. ■ Appreciate that seniors are a very diverse group: When designing a space, make sure you appeal to all seniors by providing choices for everyone. This strategy may mean adding exercise circuits as well as quiet benches under shade. ■ Consider age-related mobility concerns: Walkways should be wide, smooth and even, with no spaces where canes or wheelchairs can get stuck. Try to keep grades at no more than two percent, and make sure there are plenty of benches along the walking areas so that people can stop to rest when they need to. ■ Make the space feel safe: Seniors want to take part in their community and have a place to socialize, but in some cases, they may feel unsafe as their communities change. Create a welcoming and safe space by cleaning, offering litter receptacles and keeping areas well-lit. Promote good visibility with few or no isolated spots. Use plants or fences to buffer the noise and distraction of streets. ■ Offer lots of choices: Having fitness circuits, walking paths, benches, chess tables, areas for picnics and other activity ideas helps seniors with different needs enjoy your outdoor space equally. Keep in mind, too, that seniors may come to a park with grandchildren or younger family members. Make sure your space is inclusive and allows different generations to come together. The PlayPower Canada team members are experts at designing senior-friendly parks. We’ve already helped organizations and communities across Canada build accessible and inclusive parks that elderly visitors love. With quality products and a diverse range of fitness equipment and park accessories, we can help you design and build exactly what you’re looking for. Contact PlayPower Canada today to talk about how we can customize your park area.